Contemporary upholstered chairs are used to create looks of sleek sophistication amongst new or existing room settings. This particular accent chair is styled in an elegant manner that allows it to fit well in casual, contemporary or traditionally styled rooms. 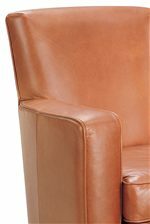 A barrel formed back gives this chair an added comfort feature creating a plush upholstered seat cushion with a back that contours to your comfort. Smooth streaming lines and a straight-forward style complete this chair with a warming grace. The perfect piece for living rooms as well as small sitting areas, this chair can be the center of attention or sit back in a nook. This chair is available in a stationary or swivel option. 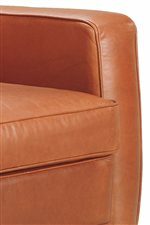 The Ethan Contemporary Swivel Accent Chair by American Leather at AHFA in the area. Product availability may vary. Contact us for the most current availability on this product. Frame Construction Many frames are made using hard wood that has been kiln dried for extra toughness. Craftsman laser cut the pieces into precise shapes that they forge together into a piece of furniture. Seat Support Many pieces offer traditional eight-way hand-tied suspension as an option. Single coil springs are attached with links and then "hand tied" to each other and the frame to achieve superior elasticity in the seat. Best used with down cushions, this kind of luxury suspension is supported by reinforced double-doweled hardwood. Padding & Ergonomics Premium high-density, high-resiliency foam seats. Comfort and long-term support is essential in every piece. Unidirectional webbed suspension seating is paired with high resiliency, high density foam cushions. Studies show webbed suspension increases the life of these highest quality cushions. The combination creates a beautiful continuous design line and a buoyant firmness. This contemporary lounge chair collection features accent pieces that will fit perfectly into an assortment of home decorating styles and trends. The perfect piece to accent a room, the Ethan chair collection allows you to choose from a stationary or swivel chair with straight track arms and a smooth upholstered style. The Ethan collection is a great option if you are looking for Contemporary furniture in the area. Browse other items in the Ethan collection from AHFA in the area.